Thom van Dooren: As I stood in the presence of this individual, the last of a species, I was reminded of how incredibly ill equipped we are as a culture to make sense of the immensity of the loss that is extinction. I spent last Tuesday afternoon with Professor Mike Hadfield, a biologist at the University of Hawai’i. Mike is a man passionate about biology – about living things and their conservation, but also about research to better understand life itself: the complex entanglements and interactions that make reproduction and other fundamental developmental processes possible at all. Most of Mike’s research takes place at the University’s Kewalo Marine Laboratory, and is focused on tube worms and a range of other small – and to many of us, unremarkable – invertebrate creatures (at least from the dominant and pervasive perspective that values those with ”fur and feathers” above all else). But Mike’s work extends beyond this marine lab. Among the many creatures that he cares about and for are a diverse array of terrestrial snails. In a single room, tucked away on the University’s main Manoa campus on the outskirts of Honolulu, Mike and a small group of staff and students have set up a ‘snail ark’ – a home outside of the forests for some of Hawai’i’s many highly endangered species of tree snails. The ark is not a particularly fancy affair. It is comprised of about six ‘environmental chambers’ that look just like refrigerators. 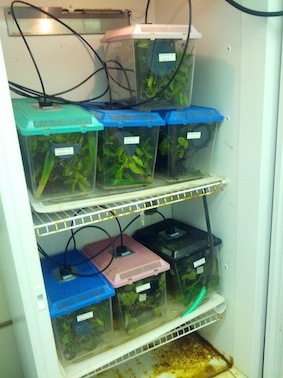 These units allow staff to control daily temperature and light cycles to provide ideal conditions for their slimy inhabitants. Inside each unit are a whole lot of small terrariums – like the kind you might keep a pet fish or rat in at home. In this case, however, the units have been filled with the o’hia and other local vegetation that these snails would ordinarily live amongst, and fitted out with a simple hose and sprinkler system that produces a short period of ‘rain’ every eight hours. Amongst the many things that I learnt chatting with Mike was the fact that these snails don’t actually eat the leaves themselves. Rather, what they eat is an invisible layer of molds and algae that they scrape off the top of these leaves. In order to ensure that their captive snails have a good, balanced, diet, Mike and his team developed a method of culturing one of these molds on agar to produce little ‘cakes’ that can be used to supplement their diets. So, why go to all this trouble to keep snails in captivity? The answer to this question is an all too familiar one. As with most captive breeding programs, this one is guided by a committed effort to hold species at the edge of extinction in the world a little longer. In fact, I was primarily in Hawai’i to conduct research on another species being conserved in captivity. Since around 2002, the ‘alala, or Hawaiian crow, has been extinct in the wild. The remaining birds now live their lives in captivity, a breeding population producing birds that will one day, hopefully, be able to return to the wider world. Unfortunately, it is not just snails and the ‘alala that are at risk of extinction on the islands. Of the 113 bird species that lived exclusively in Hawai’i prior to human settlement, 71 have now been lost. This means that roughly two-thirds of Hawaii’s endemic bird diversity is already gone. Tragically, of the 42 species that remain, 31 are federally listed under the Endangered Species Act (Leonard). Many other groups of plants and animals in Hawai’i are in a similar state. While some of Hawaii’s snails now hang on in Mike’s ark, they are a tiny fraction of the islands’ original diversity, with an estimated 75% of the more that 700 named species already having been lost (Cowie). Of the 43 species in the particular genus of snails on O’ahu that Mike’s work focuses on (Achatinella), only ten remain – their whole genus is federally listed as endangered. In short, Hawai’i is now clearly one of the ‘extinction capitals’ of the world. And yet, neither the public awareness nor the funding to begin to address this situation has been forthcoming. While conservation in general is often poorly funded, Hawai’i really is in a league of its own. Despite having a huge proportion of the US’s federally listed endangered species, the state receives a tiny percentage of the relevant funding. Without the political or economic clout to change this situation, Hawaii’s vanishing species remain largely invisible (Leonard; Restani and Marzluff). For example, a study on recent federal and state funding for bird conservation found that while around a third of the USA’s endangered birds are from Hawai’i, in total these species received only around 4% of the funding. This means that the average endangered bird on the mainland is receiving over 15 times the funding of the average Hawaiian bird (Leonard). It also means that if you happen to be an endangered bird in Hawai’i – or a snail, a plant, or any other species really – you’re pretty much out of luck. And so, slowly, silently, a whole range of endemic species – including many that are yet to be documented – are slipping away. The invisibility of the ‘extinction crisis’ unfolding in Hawai’i is perhaps, sadly, to be expected. The day before visiting Mike I spent the morning at the Honolulu Zoo. Hoping to see, or at least hear about, some of Hawaii’s endemic and endangered species, I was greatly disappointed. In a sea of exotic animals, I counted two Hawaiian locals – the nene (Hawaiian goose) and the ‘Io (Hawaiian Hawk). Where were the other Hawaiian birds, or even some snails? Even the endemic plants were far outnumbered by those from other places. While I accept that it might be hard to keep Hawaiian forest birds in captivity – in large part because avian malaria spread by introduced mosquitoes is decimating many of them – I don’t understand why visitors to the zoo aren’t told about this. If the birds themselves can’t be present, surely visitors can at least be told why they’re not, and in the process made a little more informed about them and their plight? Instead, visitors to the gift shop are greeted by row after row of stuffed tigers, lions, and bears. Within the zoo they can read about the conservation crisis in Borneo. But Hawaii’s threatened flora and fauna are, even here in the Honolulu Zoo, largely invisible. I mention this situation not to pick on the zoo, but because it is symptomatic of the wider lack of interest and information about local extinction and conservation issues in the islands. But, tiny birds, tiny snails, living in what are now often tiny and remote patches of forest, need to be made visible in some way if they are to survive. 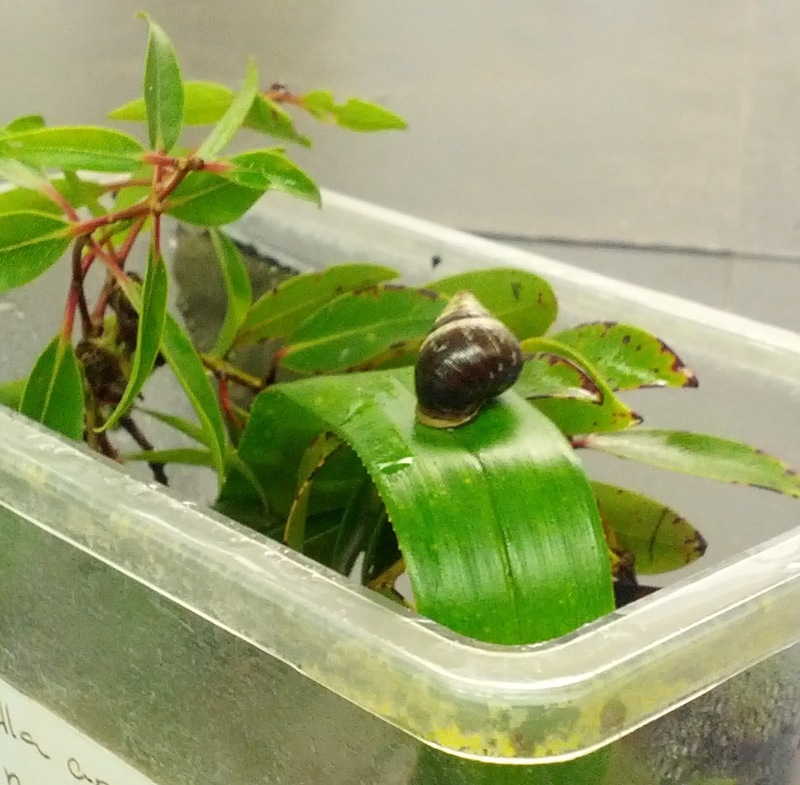 Back in the snail ark at the University of Hawai’i, work is being done to better understand the causes of the decline of some of these endemic species. In the case of snails, the situation is now pretty well understood. In little over a thousand years these species went from having no significant predators at all, into an environment with numerous overlapping threats. First of all came the rats – introduced by Polynesian peoples, but then supplemented with additional species by later European explorers and settlers. Rats can eat a huge number of snails when they put their minds to it, and they have done just that in Hawai’i. In addition to these key predators, over the years Hawaii’s endemic tree snails have also had to cope with massive losses of native forest habitat and the introduction of other significant predators – like Jacksons chameleons and a species of larger carnivorous snail. But, amongst the many endangered snails that I encountered that day, one in particular stood out. A single snail in a terrarium all on its own. This tiny being is now thought to be all that is left of its species. Despite over a decade of searching in the wild, Mike and the others have been unable to locate any more (Achatinella apexfulva). When this snail dies, a whole evolutionary lineage will pass from the world with it. Standing in its presence, I felt the weight of a collective failure in which all of us, to a greater or lesser extent, are complicit. But I was also reminded of how incredibly ill equipped ‘we’ – at least many of us – are by our own cultures to make sense of the immensity of the loss that is extinction. As a philosopher whose research and writing focuses primarily on death and extinction, I have spent a lot of time reflecting on these topics: exploring what extinction means, how diverse lives are drawn into the fray, what obligations we might have to hold open space in the world for other forms of life. In addition to reading, thinking and talking to people on these topics, I have also spent time with many animals whose lives are lived at the edge of extinction. I’ve fed ‘alala and walked amongst whopping cranes, I’ve sat with endangered albatross who are tending to their eggs. To some extent, my work has begun to feel like a journey along the edge of extinction; an ongoing act of witnessing in an effort to at least acknowledge some of what is occurring in this time of incredible loss that some biologists are now calling the sixth ‘mass extinction event’ in Earth’s history. And yet, in the presence of this singular individual I found myself unable to make any real sense of the situation. I tried to think about the millions of years of evolutionary history, the countless generations of living beings, that have been required to produce a species that now finds its singular expression in this one, fragile, organism. I tried also to imagine all those generations that might have been. Were it not for the presence of rats, humans and others, in the fullness of time this species may even have evolved into something distinct from its current form – as Darwin and others taught us, species are always becoming more than themselves, always becoming other than they are. Except, of course, those like this one whose entire future is now captured within the life of a singular individual. In my own work I have tried to bring philosophy into conversation with evolutionary theory, biology and ethology (the science of animal behavior), along with ethnographic work with communities who are bound up in one way or another with disappearing species. In so doing, I have tried to make a little more sense of the significance of what it is we do when we drive others over the edge of extinction. But how can we really make sense of such a wanton act? Ultimately, I cannot claim to have stumbled across any absolute answers – in fact, the more time I spend working in this area the more I realize that every extinction is utterly unique; each its own slow unraveling of a delicate tissue of living beings and their ways of life. And so, what is ultimately needed in Hawai’i is decisive conservation action. But as societies we also need to take the time to reflect a bit more deeply on the diverse fabric of our living world and our place in it. Too many species disappear quietly in nondescript little rooms on university campuses or in captive breeding facilities. Too many others are heading in that direction in dwindling forests around Hawai’i and elsewhere. Standing in the presence of a single tiny snail, I was reminded that much work remains to be done to make these disappearing individuals and their vanishing species more visible; to draw these precious and precarious ‘ways of life’ into the spotlight and begin to insist that they matter, and that we have an obligation to hold open space for them in our shared world.